← I don’t know where my soul is. 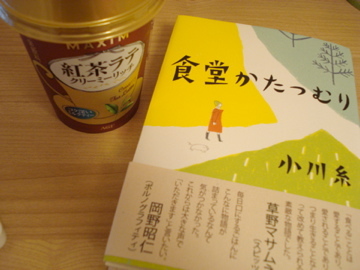 Last week,I bought a book titled “Shokudou Katatsumuri”. This is a story about woman who was left by her boyfriend. Her boyfriend is Hindu and they lived together in a small apartment. One day,when she came back from work,he was gone with everything in the room. Money that they saved to open a restaurant together,furniture and every kitchen utensils. She was surprised but not angry, even though,she lost her voice because of the shock. She just left the room and took a bus to go back to her home town. She loved the town but did’t like her mother so she left the town when she was 15. Only one person or group can eat the food each day. She has a interview with the guest and then she makes a menu for them with a lot of ideas that her grandma taught until died. She really loved her grandma. The description in the book is tender and soft. I can imagine the smell when she is cooking. but it was too late to realize. Her mother got cancer and can live only few more months. She decided to make food for mother’s wedding with her first love. Few weeks later of the wedding, her mother died. she decides that going to live and keep cooking. After reading this book,I really wanted to cook!! 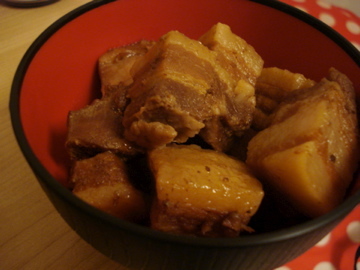 I bought a chunk of pork,cubed the meat and cooked by rice cooker. This makes me remember my grandma’s cooking. I miss her and her cooking since I left my home. Since my mom passed away,grandma has done every house-work. When I came back from work in the morning,living room was full of good smell of breakfast. Honestly,I didn’t want to leave my home. I want to eat grandma’s food everyday and I was happy with my family. But I knew that it would be not good for me. I didn’t want to be like that. and keep living and cooking like the woman in the book do. I feel the same sometimes. When Im in very difficult situation, just being with family helps me a lot . They are not replaceable. Anyway thanks for beautiful post ! I’m really happy to hear from you. Anyway how are you doing? I think I haven’t seen you long time on your blog. Hahaha…I’ll cook for you whenever you come to Japan,Jens!! You have to eat a lot!! It is a very nice and sad story and you have explained very well. It has been a lovely post, Shiori. I’m so glad to read your comment!!! !